Check out this sneak peek of Haven, Fridays at 10/9c. 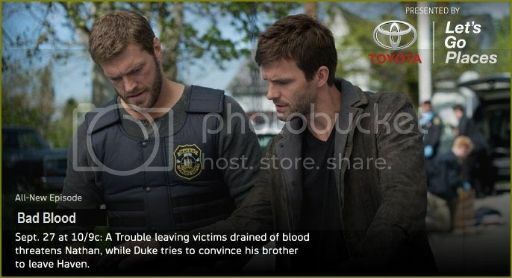 Nathan (Lucas Bryant) is on the case when bodies that have been drained of all their blood are discovered; at the same time, Duke (Eric Balfour) tries desperately to convince his half-brother Wade (Christian Camargo) to make his stay in the troubled town of Haven a short one. Guest stars include Christian Camargo, Kate Kelton and Adam Copeland.